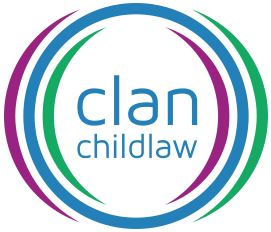 Clan Childlaw is an independent charity and law centre established in 2008. We have offices in Edinburgh and Glasgow. We provide a unique child-centred legal outreach service to children and young people in Edinburgh, the Lothians, Glasgow and surrounding areas. Provide children and young people with their own specialist lawyer to represent their interests and enable them to take an active part in legal decision making processes that affect them. Provide a unique legal outreach service to children and young people allowing them to meet with a solicitor at a time and place suitable for them and in a place of their choosing. Provide legal services which are “child-centred” : designed to meet the needs of children and young people to give them the best chance of accessing and engaging with legal services. Providing a free, accessible Legal Information Service that helps children, young people families and those working with them to identify legal remedies and find a solicitor to represent them. Focus on the rights views and interests of children in decisions of local authorities, Children’s Hearings and the courts. Increase the awareness, knowledge and skills of professionals across Scotland in relation to the rights of children and young people. Influence policy and advance legal change which protects and promotes the rights of children and young people in Scotland within the context of the United Nations Convention on the Rights of the Child. Base all our learning and development and policy work on the evidence we gain from our legal practice working with children and young people about how the law affects them, what issues matter to them and the current context for practitioners and professionals. Work in partnership with other organisations and engage with and lead numerous groups and consultations, on a range of children’s rights and child law issues and towards implementation of the UNCRC. Through the work of our Strategic Litigation Group: share good practice and knowledge and identify test cases and legal interventions that will advance the interests of children in the development of child law. Draft amendments to legislation, present at Conferences, contribute to research, advise on the development of guidance, provide easily accessible information on the law, and write articles and guidance to raise awareness of issues such as sibling contact. We are delighted to be a Host Organisation for The Legal Education Foundation Justice First Fellowship scheme in Scotland.